In his epoch-defining book, The Long Tail, WIRED editor-in-chief Chris Anderson explores the statistically rooted theory of the same name. He suggests, “Our culture and economy are increasingly shifting away from a focus on relatively small number of hits (mainstream products and markets) at the head of the demand curve, and moving toward a high number of niches in the tail.” He romances this theory in the context of dominant market forces, including the diminishing physical requirements of distribution and the proliferation of individual content producers empowered by the Internet and new media technologies. His clarifying point is critical,“The Long Tail starts with a million niches, but it isn’t meaningful until those niches are populated with people who want them.” Ay, there’s the rub. The Democratization of Production and Distribution. Everything really comes down to the basic economic concept of demand and supply. The difference now is that the cost of reaching niches is reducing dramatically -– thus driving the democratization of production and distribution. 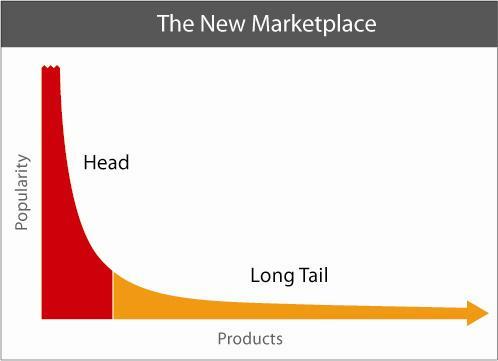 In his addendum chapter, Anderson addresses the “the Long Tail of marketing.” The premise of this chapter is that the fragmentation of markets is requiring the fragmentation of marketing. More important, as I have proposed in earlier posts, the user-driven Web is turning the paradigm of traditional marketing communication on its ear. Understanding the Dynamic of Influence. The hyperlink is, indeed, the new response device. Traditional metrics, such as audience size and readership are becoming increasingly stale and even irrelevant. Now, response is measured in real-time interactivity—clicks and click-thrus. Action. Anderson says “The hyperlink is the ultimate act of generosity online.” Placing a hyperlink in content signifies tacit endorsement of the associated content and simultaneously gives the author a new brand of authority—the power to refer. The Power of the Peer. Given this new focus on the influencer, we as fundraisers could not be in a better place. The development “sweet spot” has arrived. We know that that people give to people, not institutions. And now, the cultural evolution of communication is giving our volunteer fundraisers more power and influence than ever before. We just need to find the right tools to make them the most successful “askers”— and us the most effective “impresarios” of generosity. Let us know what you think. Ask a question, or leave a comment. Tell us know what you are doing to lake advantage of this rare moment in history. Social media is used to push products by harnessing peers (Question: how do you define a peer). As well, power users’ personal brand is leveraged by asking them for quotes and testimonials.